Guess when I tweeted my papers? Top ten downloaded papers from my department in the last year, 7 of which include me in the author list. In October 2011 I began a project to make all of my 26 articles published in refereed journals available via UCL's Open Access Repository - "Discovery". I decided that as well as putting them in the institutional repository, I would write a blog post about each research project, and tweet the papers for download. Would this affect how much my research was read, known, discussed, distributed? I wrote about the stories behind the research papers - the stuff that doesn't make it into the official writeup. From becoming so immersed in developing 3D that you start walking into things in real life, to nearly barfing over the front row of an audience's shoes whilst giving a keynote, to passive aggressive notes from an archaeological dig that take on a digital life of their own, I gave a run down, in roughly reverse chronological order, of the 12 or so projects I've been involved in over the past decade that resulted in published journal papers. Along the way, I wrote a little bit about the difficulties getting stuff up there on the institutional repository in the first place, but the thing that really flew was my post on what happens when you blog and tweet a journal paper: showing (proving?) the link between blogging and tweeting and the fact that people will download your research if you tell them about it. So what are my conclusions about this whole experiment? Some rough stats, first of all. Most of my papers, before I blogged and tweeted them, had one to two downloads, even if they had been in the repository for months (or years, in some cases). Upon blogging and tweeting, within 24 hours, there were on average seventy downloads of my papers. Seventy. Now, this might not be internet meme status, but that's a huge leap in interest. Most of the downloads followed the trajectory I described with the downloads to Digital Curiosities, in that there would be a peak of interest, then a long tail after. I believe that the first spike of interest from people clicking the link that flies by them on twitter (which was sometimes retweeted) is then replaced by a gradual trickle of visitors from postings on other blogs, and the fact that the very blog posts about the papers make them more findable when the subject is googled. People read the blog posts - I have about 2000 visitors here a month, 70% new, with an average time on the site of 1 minute and 5 seconds. You come here and tend to read what I have written (thanks!) and seem to be clicking and downloading my research papers. The image above shows the top ten papers downloaded from my entire department over the last year. There were a total of 6172 downloads from our department (UCL Department of Information Studies is one of the leading iSchools in the UK). Look at the spikes. That's where I blog and tweet about my research. I'm not the only person producing research in my department (I think there are 18 current members of staff and a further 20 or so who have moved on but still have items in the institutional repository, but I'm the only person who has gone the whole hog on promoting their research like this). You will see that 7 out of 10 of the most downloaded papers from my Department in the last calendar year have me in the author list. As a clue, I dont know anything about Uganda, e-books, or classification in public libraries. 27 out of the top 50 downloads in our department in the last calendar year feature me (as a rough guide, I get about 1/3 of the entire downloads for my department). My stuff isn't better than my colleagues' work. They're all doing wonderful things! But I'm just the only one actively promoting access to my research papers. If you tell people about your research, they look at it. Your research will get looked at more than papers which are not promoted via social media. The paper that really flew - Digital Curiosities - has now been downloaded over a thousand times in the past year. It was the 16th most downloaded paper from our entire institutional repository in the final quarter of 2011, and the 3rd most downloaded paper in UCL's entire Arts Faculty in the past year. It's all relative really - what does this really mean? Well, I can tell you that this paper was the most downloaded paper in 2011 in LLC Journal, where it was published (and where it lives behind a paywall apart from being available free from Discovery). LLC is the most prestigious journal in the discipline I operate in, Digital Humanities. The entire download count for this paper from LLC itself, which made it top paper last year? 376 full text downloads. There have been almost 3 times that number of downloads from our institutional repository. What does this mean? What can we extrapolate from this? I think its fair to say: It's a really good thing to make your work open access. More people will read it than if it is behind a paywall. Even if it is the most downloaded paper from a journal in your field, Open Access makes it even more accessed. However. I might just have written a nice paper that caught people's interest: there are, after all, no controls to this are there? No controls! How can we tell if papers would fly without this type of exposure? Well. Erm. I might not have have tweeted one or two papers to see the difference between tweeting and blogging about papers and not doing so. Take the LAIRAH (Log Analysis of Internet Resources in the Arts and Humanities) project, which I wrote about here. We actually published four papers from this research. I tweeted and promoted three of them actively. One I didnt mention to you. Here are the download counts. Guess which one I didnt circulate? The papers that were tweeted and blogged had at least more than 11 times the number of downloads than their sibling paper which was left to its own devices in the institutional repository. QED, my friends. QED. I cant know if the downloaded papers are read though, can I? The only way to do so is to enter the murky world of citation analysis. The trouble with this is the proof of the pudding will come to light in a few years time - if someone reads something of mine now and decides to cite it, its going to take 1 or even 2 years - or more - for it to appear in my citation list. So, I'll be keeping an eye on things, not too seriously as we all know things like H index are problematic. Just for the record, at time of writing, I have 218 citations, according to Google scholar. My H index is 8, and my i10 index is 5, which is ok for a relatively young Humanities scholar (I'm still technically an Early Career Researcher for another year, as defined by the UK funding councils). Digital Curiosities only has 3 published citations to date. 3 published citations. Remember, it's been downloaded over 1300 times, between LLC and our repository. Will this citation count grow? Will I be able to demonstrate, over the next few years, that retweeting leads to citation? 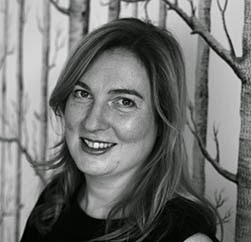 Will I be able to tell how people came across my research - if they come across my research? We'll see. Dont worry, I'll blog it if I have anything to say on this. The final point to make is that people don't just follow me or read my blog to download my research papers. This has only been part of what I do online - I have more than 2000 followers on twitter now and it has taken me over 3 years of regular engagement - hanging out and chatting, pointing to interesting stuff, repointing to interesting stuff, asking questions, answering questions, getting stroppy, sending supportive comments, etc - to build up an "audience" (I'd actually call a lot of you friends!) If all I was doing was pumping out links to my published stuff would you still be reading this? Would you have read this? Would you keep reading? My blog is similar: sure, I've talked about my research, but I also post a variety of other content, some silly, some serious, as part of my academic work. I suspect this little experiment only worked as I already had a "digital presence" whatever that may mean. Thanks for putting up with me. All these numbers, these stats. Those clicks were made by real people. Thanks! What next? From now on, I will definitely post anything I publish straight into our institutional repository, and blog and tweet it straight away. After all, the time it takes to undertake research, and write research papers, and see them through to publication is large: the time is takes to blog or tweet about them is negligible. This has been a retrospective journey for me, through my past research, at a time when I came back from a period of leave. It's been fun to get my act together like this - in general I needed to sort out my online systems at UCL, so it gave me some impetus to do so. But it has shown me that making your research available puts it out there - and as soon as I have something new to show you, you'll be the first to know. And here are a list of my personal top downloaded items from our repository, with download count since October, when I started this. Just for your eyes only, you understand. Terras, M (2009) Digital Curiosities: Resource Creation Via Amateur Digitisation. Literary and Linguistic Computing , 25 (4) 425 - 438. 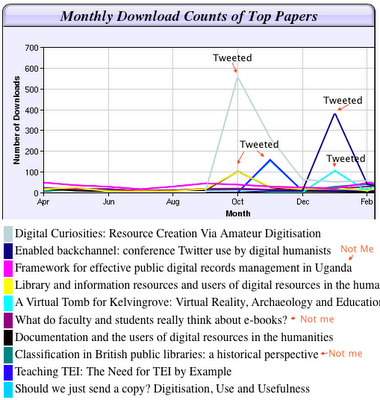 Ross, C and Terras, M and Warwick, C and Welsh, A (2011) Enabled backchannel: conference Twitter use by digital humanists. J DOC , 67 (2) 214 - 237. Warwick, C. and Terras, M. and Galina, I. and Huntington, P. and Pappa, N. (2008) Library and information resources and users of digital resources in the humanities. Program: Electronic Library and Information Systems , 42 (1) pp. 5-27. Terras, M (1999) A Virtual Tomb for Kelvingrove: Virtual Reality, Archaeology and Education. Internet Archaeology (7). 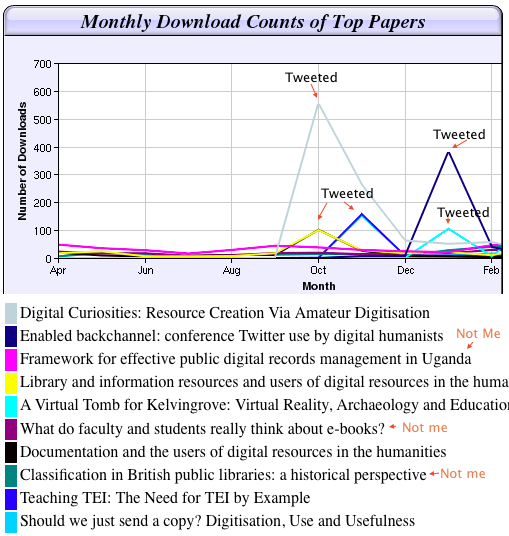 Warwick, C and Galina, I and Rimmer, J and Terras, M and Blandford, A and Gow, J and Buchanan, G (2009) Documentation and the users of digital resources in the humanities. J DOC , 65 (1) 33 - 57. Terras, M and Van den Branden, R and Vanhoutte, E (2009) Teaching TEI: The Need for TEI by Example. Literary and Linguistic Computing , 24 (3) 297 - 306. Warwick, C and Terras, M and Huntington, P and Pappa, N (2008) If You Build It Will They Come? The LAIRAH Study: Quantifying the Use of Online Resources in the Arts and Humanities through Statistical Analysis of User Log Data. LIT LINGUIST COMPUT , 23 (1) 85 - 102. Warwick, C. and Fisher, C. and Terras, M. and Baker, M. and Clarke, A. and Fulford, M. and Grove, M. and O'Riordan, E. and Rains, M. (2009) iTrench: a study of user reactions to the use of information technology in field archaeology. LIT LINGUIST COMPUT , 24 (2) pp. 211-223.